The male Plain Palm Dart, with is sharper arrow-like markings on the undersides of its wings, sets is apart from the closely allied Telicota. 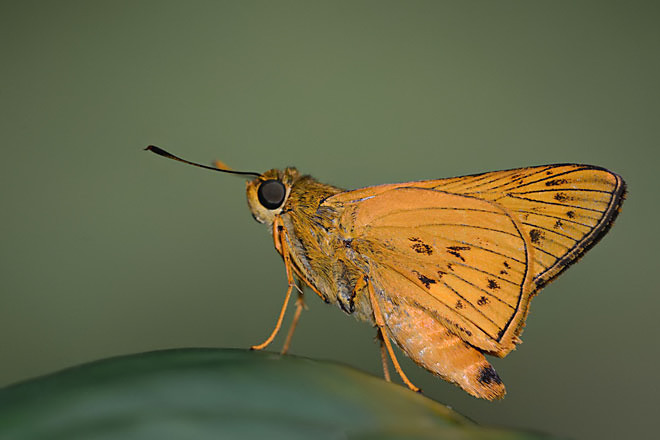 This individual, shot by ButterflyCircle member Federick Ho, perches in the usual skipper fashion, with its forelegs drawn tightly against its body, and resting only on its mid- and hind legs. Only moderately rare, the Plain Palm Dart is widespread in distribution in Singapore and can be found in urban parks and gardens, mangrove areas and also on the offshore island of Pulau Ubin.